US Weirdo Comic Singer. On his official site mentions '6ft'. I think he's just a little big taller than 6 feet now, maybe 6ft 1in when he was younger? 6'4" is crazy....he's slender and lanky, but likely never over a rock solid six feet. If he was "much taller" than you, Stephen, then you are far away from 6'1". He has held onto his height very well with his age, though. I think when he was young he could've been a bit above 6' flat, maybe 6'1 if you're generous. 6'4 he is actually very tall.is stands an inch above scott auckerman who is 6'3 in comedy bang bang. Ive alos met him at his performance at the performing arts center here in charleston sc im 6'1 hes much taller. I think he tries to downplay his height a lot. Many times on television a tall actor working with shorter actors will request lifts for other.... really look into the sutuation. If I had to guess, I would say 5'11". He seems a bit tall, but not anything to brag about. He's 6'0". You are not him and he is not you. He's 6 foot and Corey's 6'1"
His bass player must be tall, as he always towers over Weird Al in the videos. He wears Converse, so he has about a half an inch disadvantage pictured next to someone in regular shoes. I really think Weird Al is more of a 6ft1-2 guy. Hair or no Hair. theres no way this guy is 6'1" or 6'2" ! I've met Al, I'm 6'1/2" and he was just about the same height. I'd say the 6' listing is accurate. 6'1" at least. I've met him and I was looking up at him when we spoke and I'm 5'11". What nationality is he? Serbian? I'll take his word that hes 6-0. You can look 6-1-6-2 at that height depending on your frame, and he certaintly has the frame that could give that illusion. I dunno, he looks like 6'1-2". I'm right at 6'1", and he looks taller than me. I agree with 6'. People always think he's taller because he's skinny and because he usually has wacky hair and wears wacky shoes, but 6' seems right. Besides, most people I know wouldn't underestimate their height. 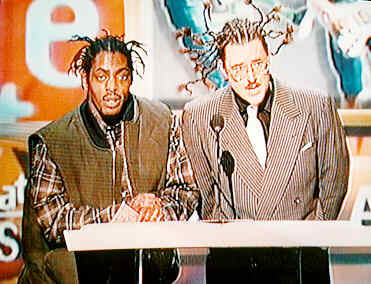 Al is leaning way more than Coolio in that picture. I could see Al at 6'1", but 6'2" is too much. He def looks taller that 6'. Yeah, odd he always looked taller to me, like 6'2", but then again here he is by Coolio and Coolio is about what 5'8"? He's 6'2" counting the hair. I thought i remembered reading he was 6'2" somewhere as well, but i havent actually seen him in photos or analysed him properly to prove it-but i do remember reading that somewhere.